Following the recent launches of the stunning LS flagship sedan and three-row RXL luxury utility vehicle, Lexus is opening a new gateway into the brand with the all-new UX compact luxury crossover. Making its North American debut at the 2018 New York Auto Show, the UX introduces a bold new design, ultra-efficient new powertrains, and innovative luxury features. The UX makes a bold statement in a segment characterised by conventional SUV themes. The striking design, notable for its crisp, prominent sculpting, and dramatically flared front and rear fenders, surrounds a cabin that provides a driver-focused cockpit and a roomy, relaxing space for passengers. A 103.9 inch wheelbase contributes to a smooth, stable ride and ample passenger space, while the compact 177 inch overall length, and best-in-class 17.1 ft turning radius lets the Lexus UX easily manoeuvre into compact parking spaces. At the rear, an elegantly simple styling treatment contrasts sharply with the flared fenders to emphasise the UX’s dynamic and strong crossover qualities. 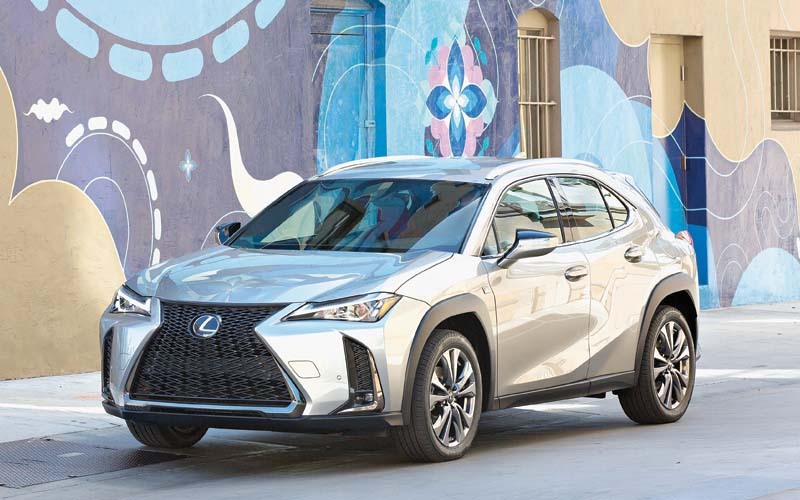 Compact and infused with dynamic attitude, the 2019 Lexus UX is engineered to deliver elegant performance, thanks to the first use of the brand’s GA-C (Global Architecture – Compact) platform. The MacPherson strut front suspension and double wishbone type rear suspension system are specially tuned for a combination of urban agility and comfort over well-worn streets. The electric power steering system features a new compact and highly rigid column assist that helps deliver crisp, immediate response to driver inputs and a precise steering feel. Engaging performance and high fuel efficiency are the calling cards of the new 2.0 litre inline four-cylinder engine in the UX 200. Delivering up to 168 horsepower to the front wheels, the all-new engine utilises advanced technologies like multi-hole direct fuel injectors, a continuously variable capacity oil pump, and VVT-iE intelligent variable valve-timing. A new Direct Shift-CVT also debuts in the UX 200. It combines the smooth, fuel-efficient performance of a conventional, continuously variable transmission with the more direct feel of a traditional gear-driven automatic. A conventional CVT uses two variable pulleys, connected by a belt, to change the effective gear ratio. 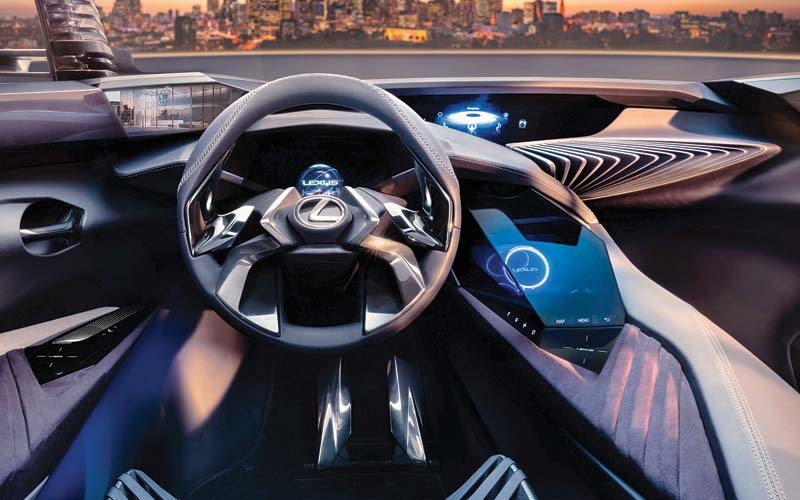 The UX, the new gateway to the brand, will offer the Lexus Safety System+ as standard equipment. It includes advanced safety technologies like Lane Tracing Assist, Dynamic Radar Cruise Control, Automatic High Beams, Road Sign Assist, and a Pre-Collision System that can recognise pedestrians at night. Additionally, PCS radar capability has been extended to enable detection of cyclists during the day – road users who are involved in a high number of traffic accidents. Staying connected on the road is essential to today’s drivers, so the UX makes it easier with a number of standard technology features. Lexus is among the first luxury automakers to feature Amazon Alexa integration, so UX drivers can ask Alexa to play music and media, read Kindle books, control smart home devices, and more. All UX models will also come standard with Apple CarPlay phone functionality. Once a compatible iPhone is connected through a USB cable, drivers can access Apple Music, maps, make phone calls, and send and receive messages, all through the multimedia display or with voice control through Siri.